Literature for Life, a program of local nonprofit arts organization, Light Bringer Project, seeks to spark a love of reading and writing in Los Angeles’ diverse youth. Filling the gap left by expensive and often outdated textbooks, our literature and artwork are selected to resonate with young people and to celebrate L.A. culture and people. We hope you’ll join us on Sunday, April 7th to celebrate the launch of Literature for Life’s sixth issue. This spring, we’re proud to feature writing and artwork from local creatives, including hip-hop artist Andrés Guzmán, multimedia artist Janine Lim, and recent UC Santa Barbara graduate Kate Kesner. Congratulations to our Issue 6 authors! Angelina Coppola grew up in Los Angeles. She is a graduate of the University of California, Berkeley, where she received her B.A in English with a concentration in creative writing. Her writing has been covered in Los Angeles Magazine , The Washington Post , and CNET Australia , among others. She has extensive experience as a teaching artist and has worked for several organizations in this capacity, including South Pasadena Arts Center (SPACE), WriteGirl, Bold Ink Writers, and Day One. She currently writes and teaches in Los Angeles. She is the In-Schools Program Coordinator of Literature for Life. Emma Demorest is a second year at UC Santa Barbara who is double majoring in film and the College of Creative Studies’ writing & literature major. A long-time admirer of sketch comedy and humor writing, she is the assistant editor of the humor column of UCSB’s Daily Nexus . Emma considers short fiction too serious most of the time, but if everyone else is going to do it, she’ll get on board. Andrés Guzmán was raised in Union City, New Jersey. He recently earned his B.A. in creative writing from the University of Southern California. He currently lives in Los Angeles. He is a voracious reader of Mexican American and African American history, and he loves hip-hop music. He is pursuing a career as a hip-hop artist and seeking work in hip-hop radio or in education to help low-income, first-generation students achieve their college degrees. Kate Kesner thinks writing is the most reliable form of transportation. A recent graduate of UC Santa Barbara’s global studies major, she is currently trying to figure out life. She likes sci-fi, dancing, and most people and is honored to be included in Issue 6 of Literature for Life . Janine Lim is a Los Angeles-based multi-disciplinary artist. Her short film, “Grandfather Clock,” and photographic work were exhibited in San Francisco and Los Angeles. She is a former student of theater and a long-time student of martial arts. Her personal essays have been published in Youth Outlook Magazine andThe Bold Italic . In 2018, she co-produced the monthly reading series Drunken Masters for Writ Large Press and performed in contemporary dance piece “Solid as a Rock” as part of the REDCAT’S New Original Works Festival. Sophie Marie has just earned her creative and professional writing degree with First-Class Honours. Since then, she’s moved from Canterbury to Wales to enjoy a quieter, slower way of life. She’s had short stories published online and in print but is currently focusing her efforts on writing a much longer piece. When she is not writing, Sophie can usually be found with an energy drink in her hand, a notebook in the other, her doggie Leia on her lap, and her pup Chewie by her feet. Vivian McInerny is a journalist and a writer. Her short fiction is published in805 Lit+Art , Dunes Review , and The Cardiff Review . She’s a Fishtrap Fellow and recipient of a Sacramento Metropolitan Arts Commission grant for fiction, and her first children’s book is forthcoming in 2021. She is at work on a second YA novel and a memoir about traveling overland through Turkey, Iran, Afghanistan, Pakistan, and India at age eighteen. Jamila Osman is a Somali writer, educator, and organizer living in Portland, Oregon. She teaches high school English and facilitates poetry workshops for marginalized youth, including currently incarcerated and immigrant and refugee youth. Her writing explores the tension between place, history, and identity. Her work has previously appeared in Pacific Standard, Catapult, The Establishment, BOAAT, DIAGRAM, and other places. She is a Voices of Our Nation Arts Foundation (VONA) workshop alum. Asha Parekh is a licensed clinical social worker who devotes time to improving Utah’s refugee systems to be welcoming and effective in facilitating refugee integration. She lives in Salt Lake City, Utah. Tim Stiles lives and writes in the San Francisco Bay Area. He received his MFA in creative writing from San Francisco State University. His poems, stories, and lyrics have been published and recorded throughout the United States and Great Britain. His poetry and photography collaboration with photographer Jay Tyrrell, entitled Botmerica: Repeat After Me, was published in 2016. Jervey Tervalon , MFA, is the award-winning, Los Angeles Times best-selling author of five books, including Understand This , a novel based on his experiences teaching at Locke High School in Los Angeles, for which he won the Quality Paperback Book Club’s New Voices award. His newest novel, Monster’s Chef, was released by HarperCollins in 2014. He was the Remsen Bird Writer in Residence at Occidental College and is now an associate professor at National University and a lecturer at the College of Creative Studies at UC Santa Barbara. He’s lectured at USC and Occidental College. He is also an award-winning poet, screenwriter, dramatist, and the Founder and Editor of Literature for Life . Jervey was born in New Orleans and raised in Los Angeles. He received his MFA from UC Irvine and studied with Thomas Keneally, author of Schindler’s Ark . The launch party will be held on Sunday, April 7th from 3 to 6 p.m. at the home of Jervey and Jinghuan Tervalon: 55 W. Manor St., Altadena, CA 91001. There is a suggested $5.00 donation at the door. I first met Gordon Henderson when I was working at SPACE in South Pasadena. He is a multidisciplinary artist, entertainer and radio announcer at KPCC. His latest body of work, Unknown Landmarks, a new exhibit of over 20 paintings, opens at Bermudez Projects on Saturday, March 9th and runs until April 27th. Here’s a little about the story behind Unknown Landmarks and Gordon’s inspiration for the project. Unknown Landmarks began when Gordon started commuting to and from work on foot and train. He has lived in Highland Park for over a decade and the artery of Figueroa from the Metro train station, past the oh-so-delicious Penny’s Burgers and onward up North Figueroa, is his usual route. Along the way, he started to notice the city’s hidden treasures—gloves, an abundance of them, melted psychedelically-colored ice cream cones, high-top Converses with no shoelaces on them (only to return the next day to witness them perfectly laced) and of course bananas, in all states. He started taking photos of these abandoned objects and posting them on his Instagram. One of the stranger oddities that crossed his path, was a stuffed shark on a telephone pole. Gordon contemplated taking it home, but took a photo instead, and left it for others to enjoy. During his walks, he started taking photographs of the businesses, particularly on North Figueroa above York Boulevard—Joe’s Upholstery & Auto Service, Lucy’s Beauty Shop, Uno Produce Market, Italiano’s Pizza, Obsession Beauty Salon and others. He was inspired by the thoughtful hand-painted signs and the usage of color and design. These businesses stand next to the steady hum of North Figueroa, a corridor with little foot traffic. To many Angelenos in transit, these landmarks are mostly framed by their car windows. Joe’s Auto Service was one of the first businesses to catch his eye. It was evocative to him, an old gas station with three units on the same lot, painted a nice primary blue and white, layered with red lettering on the side. He made a triptych on wood of Joe’s, and then set out to paint the other businesses. Now, he has over twenty paintings of these landmarks, places that, to him, have an emotional impact, an emotional pull. The opening reception for Unknown Landmarks will be held from 7pm-10pm on Saturday, March 9th at Bermudez Projects located at 1225 Cypress Avenue, Los Angeles, California 90065. We hope to see you there! I met with Gerda Govine, the Poetry Lady of Pasadena, at The Battery Bookstore on Los Robles and was immediately struck by her elegance and style. A natural poet, she has helped to shape the literary arts community in Pasadena, and beyond, through the power of poetry. Originally from the Virgin Islands, she made her way to California, by way of New York City, in 1982, and now, calls the megalopolis of Pasadena, Los Angeles, San Diego and Tijuana home. She has cultivated friendships and creative collaborations across these divides, through her work with La Casa del Tunel (The House of the Tunnel), a converted art center along the Tijuana border, co-founded by Gerda’s partner, artist Luis Ituarte, and most recently, with the opening of DesEscondido/No Longer Hidden: Public Address at the California Center for the Arts, Escondido. DesEscondido is a group show that features multimedia artwork by seventeen artists and poetry from Gerda’s latest collection, Poetry Within Reach In Unexpected Places. For the past year and a half, Gerda has facilitated “Poetry Within Reach,” a poetry reading series at the Pasadena City Council Meetings. After six months of reading her poetry at the meetings, she received a call from Pasadena Mayor Terry Tornek, thanking her for her work and asking her to continue. “Poetry Within Reach” was born. 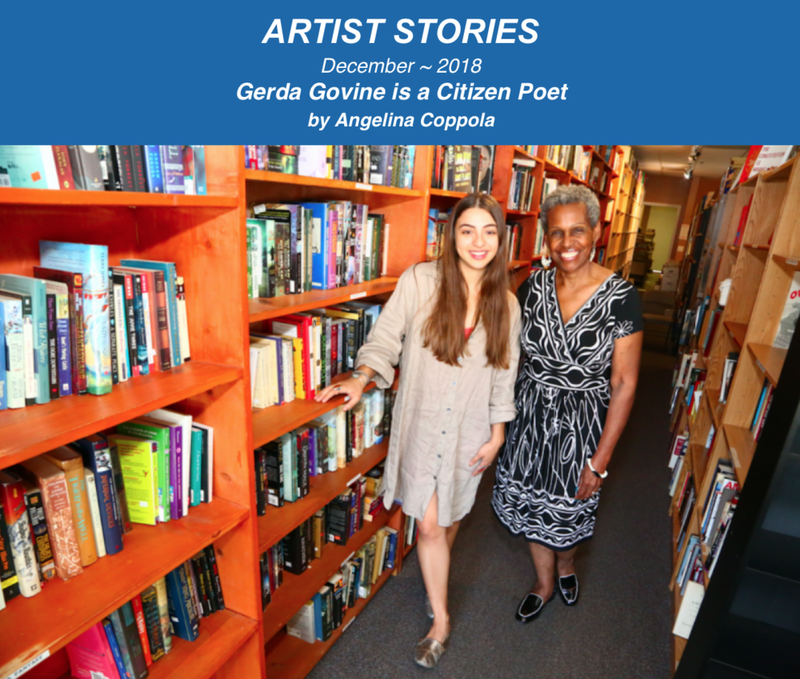 Gerda says, “I believe that as poets we have a right, a responsibility, to give back, to be civic-minded, to be citizen poets, and that’s why I started the readings at City Council.” Her goal is to create a “chorus of poets” who read at City Council meetings across the country. The Pasadena Rose Poets are members of this chorus. Founded by Gerda, the Rose Poets include Teresa Mei Chuc, Mel Donalson, Kate Gale, Damian Gonzalez, Hazel Clayton Harrison, Gerda Govine Ituarte, Shahé Mankerian, Carla Sameth, Annette Wong and Toni Mosley. The group is comprised of poetry advocates and ambassadors, who hold readings through out the city, including at the Pasadena Public Library, the Pasadena Museum of California Art and “The Noontime Reading Series” at the Pasadena Senior Center. High school students: Take out your keyboards and your wildest imagination. For the fifth year in a row, the Pasadena-based nonprofit, the Light Bringer Project, is sponsoring a science-fiction writing competition open to all ninth- through 12th-grade students enrolled in schools across L.A. County. The Tomorrow Prize for short science fiction “inspires students to explore their present through speculating about their future and to excel in the art of storytelling,” according to the website. Sci-fi is one of the most popular contemporary literary genres, especially with young writers because they all grew up with technology. This competition encourages teens to explore scientific, social, technological, environmental and philosophical themes in their writing. The winning stories will combine the exploration of these topics with well-crafted storytelling. Five finalists will be chosen. In the past, judges have included scientists from the Jet Propulsion Laboratory and celebrity Young Adult authors. The winning stories will be read on stage by famous actors in May at Litfest Pasadena. The Los Angeles Audubon will also present The Green Feather Award for the best environmentally themed sci-fi story. Hundreds of students and more than 20 schools have participated in the contest over the last four years, and organizers say this year promises to be the biggest one yet. L.A. Parent is serving as a media sponsor. As someone who spent several years teaching high school English, these writing competitions are very close to my heart. Several of my former students won awards from the Los Angeles Department of Cultural Affairs from the various competitions the department has sponsored over the years. The opportunities presented in these contests can end up being transformative for all involved. For more information on The Tomorrow Prize, see the Light Bringer Project on Instagram and Facebook @LightBringerProjectand on Twitter @LightBringerP. At the same time, share the announcement with teachers and high school writers across L.A. County. The judges are waiting to read Tomorrow’s Prize – today. 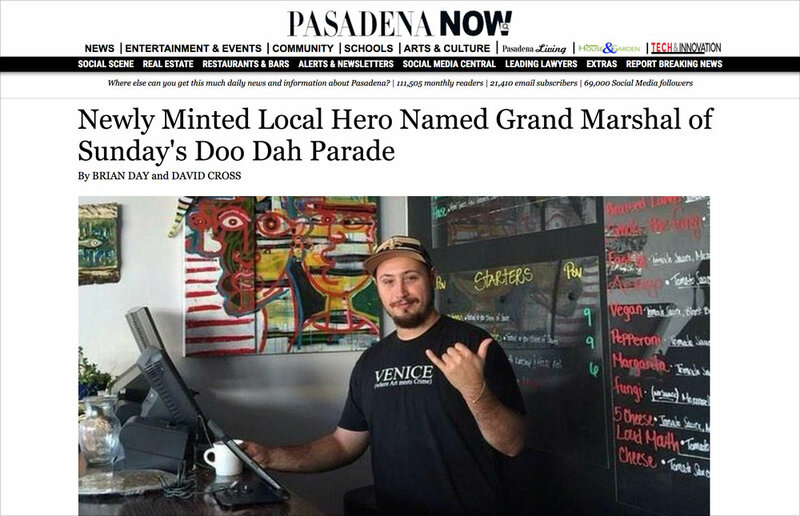 Editor's Note: We wish to clarify that the Doo Dah Parade this weekend is on Sunday, November 18. An earlier version of the story said otherwise. Leigh Adams sits on her story tree and looks up at the branches. They extend this way and that, and intertwine like arms hugging. Her purple hair catches the light, as she points at the bark, "See the smiling faces?" she asks me. Leigh has been the Artist-in-Residence and an Interpretive Horticulturalist at the Arboretum for the past ten years. She is a mosaic artist, activist, water harvester, educator, storyteller, longtime Altadena resident and all-around lovely soul. I feel very luck to have spent an afternoon talking and strolling with her through the gardens of the Arboretum--Leigh's home away from home. "Magic realism is a huge part of my life," said Leigh, as we walked the grounds. This magic can be found in Leigh's spirit. She buzzes with a warm electricity that brings you in and leaves you feeling open. It can also be found in her gardens. They are fertile and inviting places, places where you can set aside your daily burdens and daydream. One of which is the Crescent Farm at the Arboretum. The farm is Leigh's brainchild; it has continued to grow and be enhanced by the help of the community and the consistent TLC of John Latsko, an Interpretive Horticulturalist at the Arboretum and, as Leigh puts it, "the best garden husband I could ask for." At the entrance to the Crescent Farm, stands a mosaic mural that children like to trace with their fingers. Artists from Skid Row were commissioned to create it. For many years, Leigh has taught for and worked closely with Piece by Piece, a nonprofit organization that provides free mosaic art workshops to low income and formerly homeless populations. Leigh incorporates mosaic into all of her gardens and continues to host free mosaic workshops, as well as gardening workshops at the Crescent Farm. Participants learn the process behind habitat gardening--working with the land instead of against it--and water harvesting, or water optimization, a key part of Leigh's gardening practice. Water harvesting captures rainwater and water runoff, and uses it in lieu of unnatural irrigation systems. Leigh has helped to expand the public's knowledge of water harvesting, and is at the helm of the urban sustainable agriculture movement because of it. 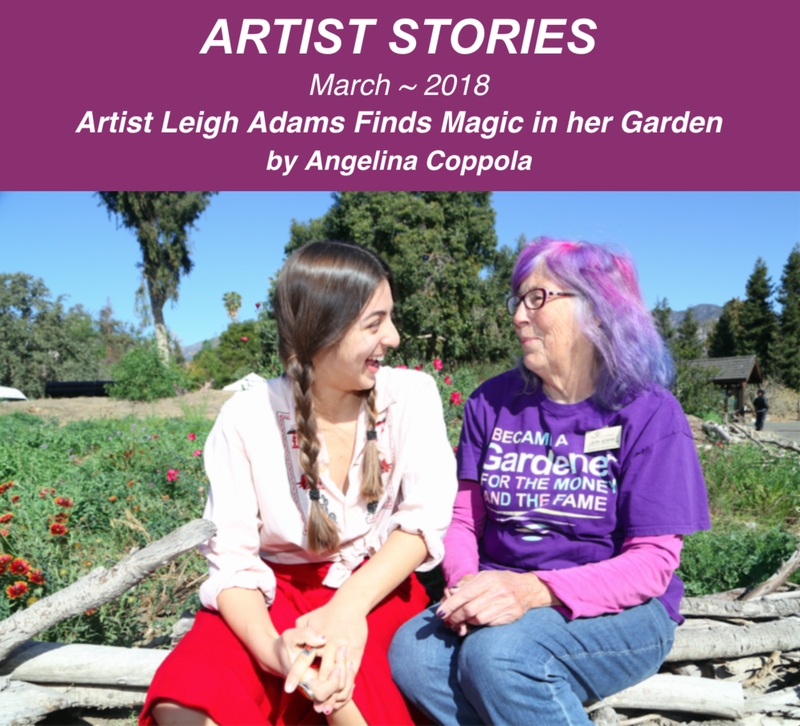 "If you master the process, you can have any product you want," Leigh said about her work in the garden, the studio, and the classroom. For decades, her work as a teaching artist has taken her into schools through out Los Angeles and Pasadena. She stresses the power of collaboration to her students and "do[ing] what you believe in and see[ing] what comes of it." Leigh's upcoming project will be working with Metabolic Studios to implement water-cleansing processes for the LA River. She is exploring the possibilities of ancient weaving with willow, a natural cleanser that belongs in the river. We look forward to seeing the ripples she creates! More information about the fabulous Leigh Adams can be found on her website.